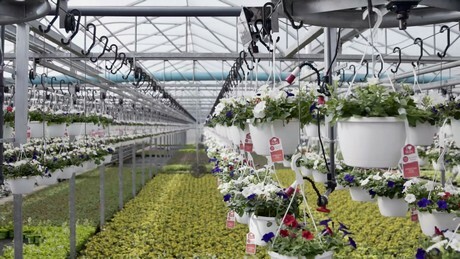 Growers and retailers can now effectively control their hanging baskets’ weight to consistently manage soil moisture for higher quality plants and reduced input costs. “OASIS gives growers the confidence that the soil moisture is at the proper level, allowing them to focus on other plant needs and gain efficiency with other horticultural practices,” says Jordan Dekker, managing partner. OASIS lets growers produce superior baskets with less water and fewer resources such as fertilizer and chemicals, by using an electro-mechanical module to measure basket weight. Growers choose their optimum basket weight, then OASIS automatically waters to that weight for every basket on the line. Each basket gets the water it needs, instead of risking overwatering, product loss and unsightly overrun. 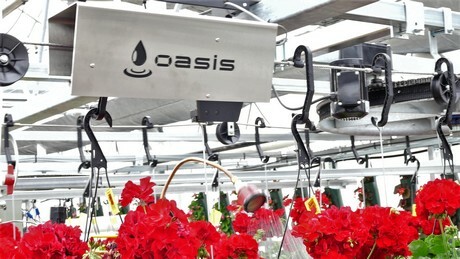 OASIS automatic hanging basket systems can easily be added to new or existing cable conveyor systems in greenhouses. And, with its mobile functionality, growers can manage hanging basket watering from anywhere via phone, tablet or other devices. OASIS is available in the Standard and Custom series, individualized for any greenhouse. See OASIS for yourself at Cultivate’18 booth 1209. Original article from Floral Daily here.